Dimensions: 4 5/8" x 14"
* Please Note: Regardless of the name on the package the brush is manufactured and distributed by Schaefer. 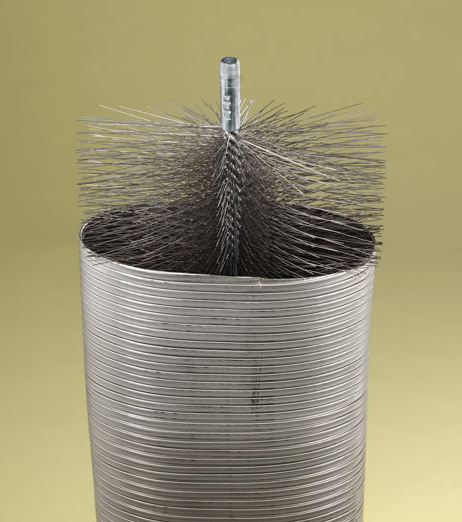 The Schaefer Large Oval Brush is designed for Cleaning OvalFlex Chimney Piping. The brush features hand construction, durable 22 gauge oil tempered steel round bristles and and a bristle design that maximizes cleaning ability by breaking up debris from an odd shaped pipe. The chimney brush rods breaks down and extend quickly and easily for fast cleaning and convenient use. The Schaefer Large Oval Brush for Cleaning OvalFlex Chimney Piping is manufactured by Schaefer.